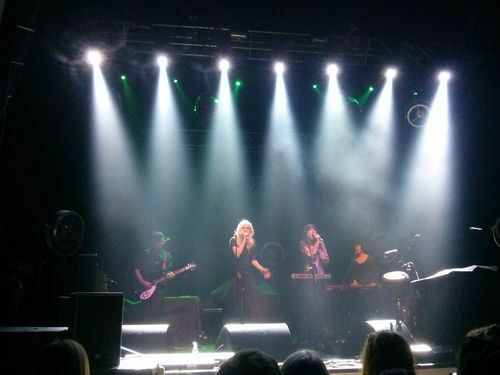 With support from Khushi and Say Lou Lou, this line-up was always going to provide a night of sensational harmonies, dark synth pop and formidably powerful vocals. Kalim Patel, certainly makes you feel ‘Khushi’ inside when he sings to the audience ‘the silence will take care of itself / but I want you and not somebody else’. His set provided beautifully delicate vocal harmonies, Local Natives-esque drum beats and effortless guitar strumming, making for an easy-listening experience filled with melodic indie pop. Say Lou Lou – Australian-Swedish twin sisters – appear on stage looking like the Ying and Yang symbol. Miranda with golden blonde hair dressed in a black crop and high-waisted jeans and Elektra with dark hair and black make-up, in a gleaming golden shirt. Their music is powerful and emotional, and they sing heartfelt lyrics passionately with their innocently sweet voices. Yet these sisters are far from innocent, with dark lyrics such as ‘They say that every day is a new beginning / but I know I’m not alone when the darkness hits me’. How true their lyrics are, as it’s clear they take so much comfort from each other. Throughout their set they imitate each other’s movements and gestures, almost as if it were choreographed, yet, you know it’s natural because the sisters seem genuinely in tune with each other. As an LED screen is fitted at the back of the stage, audience members wait for the main event. Screaming teenage girls are impatient for heartthrobs Dot Major and Dan Rothman, and eventually, idol Hannah Reid comes on stage; the tiny 20-something with the massive voice. And what a voice she has. Despite the fact that during their hour’s set she gulps down three hot drinks due to illness, it doesn’t affect her performance at all. They begin with the song that made them famous, ‘Hey Now’ which showcases Hannah’s vocal range spectacularly. Dan and Dot are flawless in their transition from synthesisers to drum kits to keyboards, and look so at ease on stage while Hannah takes control vocally. The trio are so appreciative, thanking the audience for coming numerous times, and saying how grateful they are for all the support. It is therefore even more emotional when Hannah sings ‘Strong’. All that can be heard during the sparse beginning, is the audience singing along to lyrics Hannah probably wrote in her bedroom at uni: ‘Excuse me for a while / While I’m wide-eyed and I’m so damn caught in the middle’. The ethereal echoes are hauntingly beautiful, and the melodies are melancholy to the point of tears, but also euphoric and uplifting. They finish with an encore of ‘Metal & Dust’ which just proves how talented these three recent graduates really are. The track builds and builds; Hannah riffs over the top of Dan’s bass guitar, strobes flash and the LED screen flickers to the point of a power cut, until Dot performs a spectacular drum solo at the crescendo. 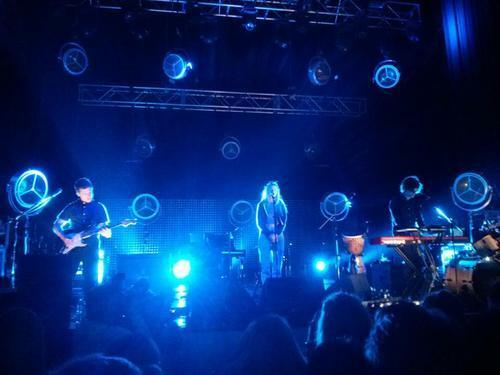 London Grammar really is a quiet force to be reckoned with. They are three of the most talented musicians in the business and yet so modest, which, in my opinion, makes for half of their success.